The past weekend Little Flowers Girls’ Club visited St. Anne’s Guest Home. The average age of members is eight. Generally at our meetings, the girls give a presentation on a saint and a virtue in which they have been working on. The residents at St. Anne’s provided an excellent audience for our young girls to make these presentations. From a six year old to ten year olds, these girls were not the least bit intimated by the kind people who reside at the Guest Home. I was so pleased that the residents were interested in the girls presentations. Faith…seeing our elderly brothers and sisters having confidence in their surroundings and caregivers. Their past and current experiences can teach the younger generation about trust in God regardless of our state in life. Hope…as the elderly reach a place in life in which possibility of death and eternal rest becomes nearer, they can demonstrate hope in the Lord for their eternal peace and salvation. They can also demonstrate hope for their family who have gone before them and who will be left behind on earth with in confidence in prayer. Love of God…the elderly can demonstrate to the youthful their love of God through regular Mass attendance and adoration which are so beautifully provided within their home. They can also demonstrate this through the way in which they decorate their apartments or rooms and how charitable they are to others for the glory of God. Love of Our Neighbor…living in tight-knit circumstances particularly after being independent and industrious for the majority of their lives can create hardships and more opportunity to show love of neighbor through compassion and patience for their neighbors. Just as living at home with our families we sacrifice to make others happy and have patience when things can become annoying this is ten-fold in a living environment with multiple people. Obedience…the elderly demonstrate obedience by following the rules established in the setting in which they are living, by being civic minded, by being good examples to the children through their interactions with others. Most of all they demonstrate their obedience to God by serving Him, loving others and accepting help from those who are trying to glorify God through a ministry of love and assistance. Piety…the elderly can demonstrate this by desiring always to do that which is pleasing to God. They can express this through actions and conversations with staff, visitors and neighbors. Humility…as our bodies age they can disappoint us through limitations and pain. It is a humbling experience. The elderly are phenomenal examples of persevering despite their bodies limitations. They can show us how to glorify God through the things they are able to accomplish, especially creatively accomplish. Industry…we can learn from the elderly and from the staff and leaders at the Guest Home. They work hard to make the lives happy and healthy for those that are living there. Doing their work to glorify God. 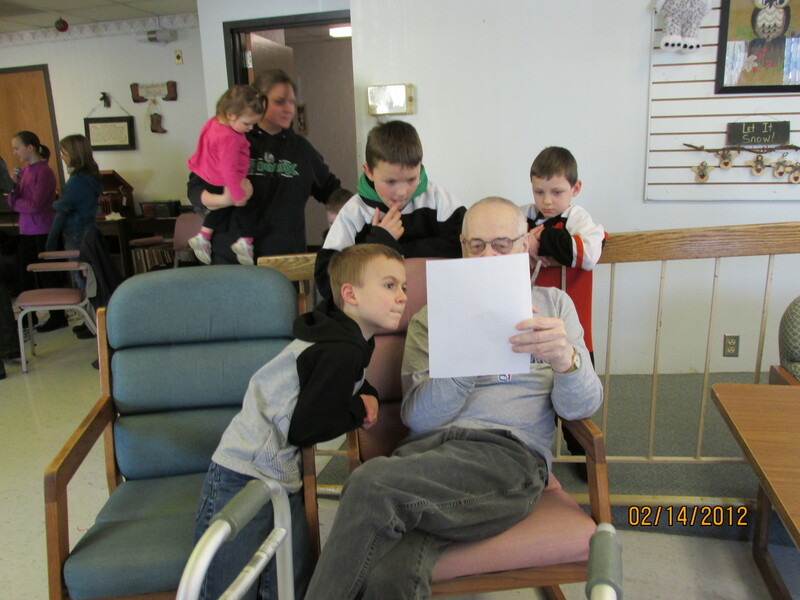 Truthfulness…when our elderly friends can share their experiences with us through dialogue. The good times and the bad. Reminding us of how God has been ever present in their lives. Members of the Warsaw/Minto-based “Little Flower Girls Club” visited here Saturday morning, attending Mass in our chapel and then joining our residents at snack-time to give presentations on the saints they had studied. After this, the girls and their mothers enjoyed a tour of our facility, during which they were especially intrigued by our “sky-walk,” which connects the two buildings that make up St. Anne’s. We enjoyed having them visit. Such times when young people come are a blessing to us and, I believe, enrich the lives of the children as well. It helps our residents to see young, smiling faces and to have the chance to interact with them; the young people who visit can grow and learn from visiting with members of an older generation. At St. Anne’s, we are grateful for the frequent visits from young people throughout the year. A visit to our “Happenings” page will illustrate the number of groups that come in, from time to time, to visit our residents. Like yesterday’s visit, all these interactions can help both the young people and our residents to “blossom;” we truly enrich each other’s lives. Although I don’t have any photos from yesterday’s gathering, I wanted to share a couple that illustrate the joy of inter-generational encounters.